Alcohol is a preservative, not a fixative. Alcohol does not penetrate invertebrate tissue as well as fixatives such as formalin. Therefore, unless alcohol is used in sufficient strength and quantity the sample will decay. We do not use formalin because it is a carcinogen and a mutagen. Please do not use dyes such as Rose Bengal. They do not facilitate sorting of freshwater samples and some dyes are suspected carcinogens. We recommend using 90-95% denatured ethanol to preserve field samples. Select a technical rather than reagent grade of ethanol to save on cost. Unless you have a special Alcohol, Tobacco and Firearms permit, you can only purchase denatured ethanol. “Denatured” means other alcohols and smelly ketones are blended with the ethanol to keep it from being consumed. Isopropyl alcohol (rubbing alcohol) can also be used in a pinch. It is available from grocery, drug and discount stores. If you decide to use isopropyl alcohol, purchase 90% rather than 70% concentration. We recommend Tarr, LLC as a supplier of alcohol in the western United States. A 5-gallon tin of Tarsol E2-190 denatured ethanol costs approximately $50. See the Tarr website for more information, including their delivery service area. Fisher or VWR Scientific can ship small quantities of denatured ethanol, but for a higher cost. Never leave unpreserved samples exposed to direct sunlight because the invertebrates will die and decay rapidly. Preserve samples within an hour of collection. Preserved samples do not have to be refrigerated, but do store them in a cool place away from direct sunlight. Be as gentle as possible handling samples so that invertebrates are preserved intact, rather than ground into pieces. 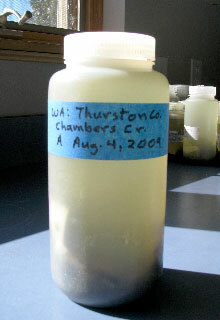 Sample bottles should not be filled more than half full with a sample of sediment, bugs and debris (see photo). Make sure the sample is well drained of water before transferring it to the bottle. Then fill the bottle with 90-95% denatured ethanol or isopropyl alcohol. Invert the bottle several times to ensure the alcohol is well mixed with the sample. For samples that contain much fine detritus or filamentous algae, which retain a lot of water, we recommend that half the alcohol be decanted off at the end of the day and replaced with fresh alcohol.